In the next few days many parts of the country will get into festive mood, beginning with Ganesha festival. 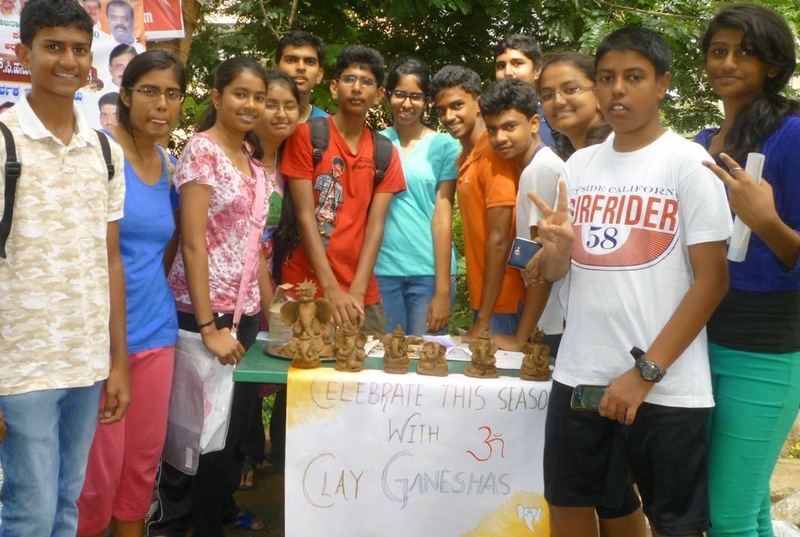 Especially in Maharashtra and Karnataka thousands and thousands of Ganesha idols will be brought home/established in public places. And after the festivities are over, on the day of closure of the festival all these idols will be immersed in water bodies. Tons of chemicals from the paints on the idols will contaminate the water. 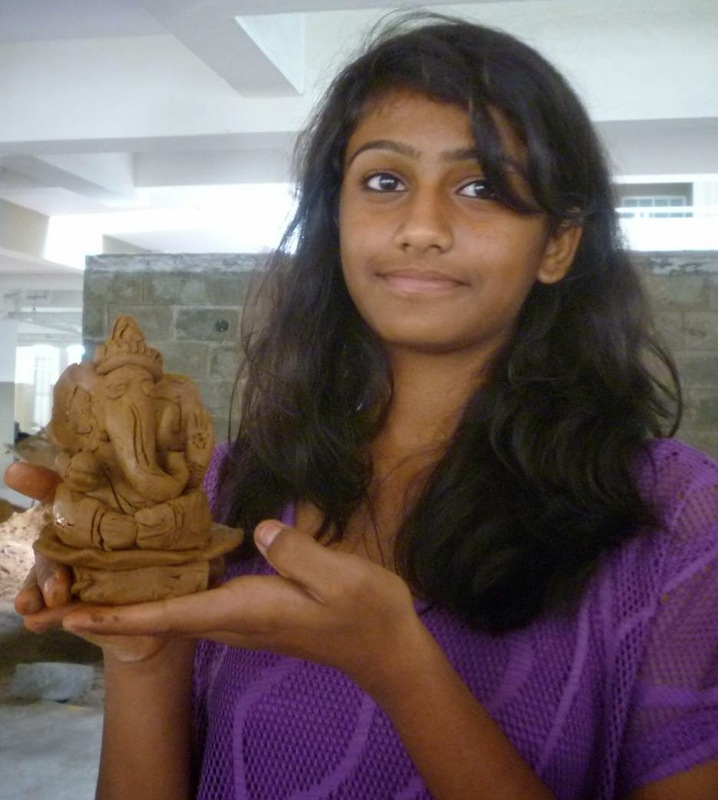 RR Nagar I Care, an NGO in Bangalore inspired about 50 students of National Hill View School in the neighbourhood of Raja Rajeshwari Nagar to create eco friendly Ganesha idols by teaching them to make using safe potter's clay. 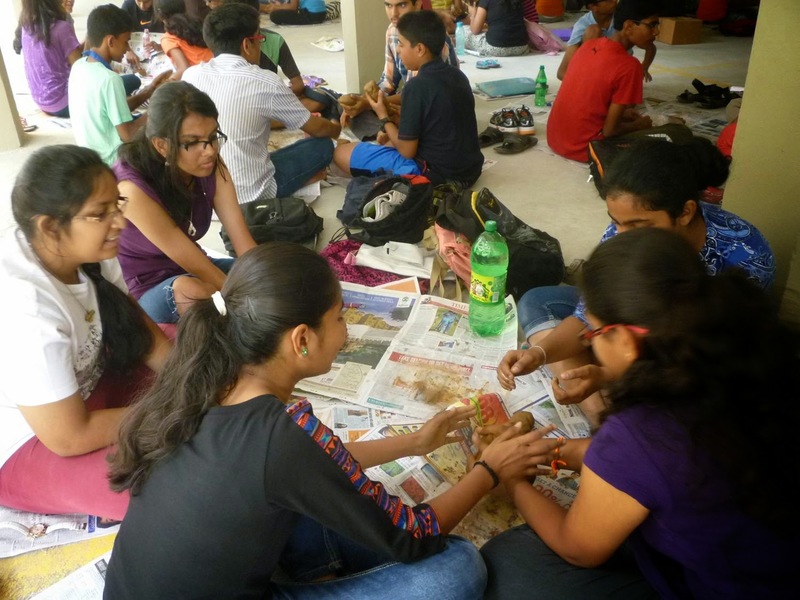 And the next day they all went into the community and engaged scores of citizens into conversation about water pollution and need for not using painted idols. 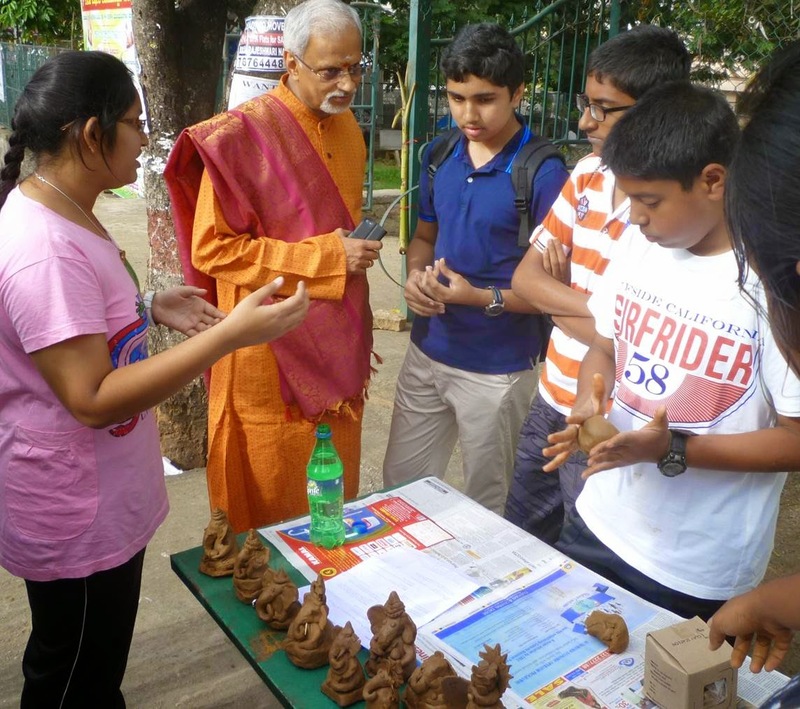 As the students demonstrated actual making of the idols, many citizens got inspired and carried home the clay packs to make Ganesha by themselves. 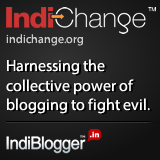 Now, that is India I Care! An extract from the book 'The Razor's Edge' by Osho. A very interesting read. Enjoy. D I L I P.
"EASY IS RIGHT. BEGIN RIGHT AND YOU ARE EASY. CONTINUE EASY, AND YOU ARE RIGHT. AND FORGET THAT THE GOING IS EASY." Anand Shanti, Chuang Tzu is very rare - in a way the most unique mystic in the whole history of man. His uniqueness is that he talks in absurdities. All his poems and stories are just absurd. And his reason to choose absurdity as his expression is very significant: the mind has to be silenced. With anything rational, it cannot stop; it goes on and on. Anything logical and the mind finds nourishment through it. It is only the absurd that suddenly shocks the mind - it is beyond mind's grasp. His stories, his poems and his other statements are so absurd that either people simply left him, thinking that he is mad.... Those who were courageous enough to remain with him found that no other meditation is needed. Just listening to his absurd statements, the mind stops functioning. And that is the meaning of meditation. Most of the Western translations of treatises from the East on meditation have fallen in the same track. They have used the word meditation as if it is concentration. And in fact the English word meditation seems to be synonymous with concentration. English has three words - concentration, contemplation, meditation. None of them comes even close to the Eastern word dhyana, that became in China ch'an and in Japan zen. The root is the Sanskrit word dhyana, and it will be very good for you to understand the distinction. In concentration your mind is focused, narrowed only on one object. A famous story about one of the great master archers.... Arjuna says that his teacher, Dronacharya, was giving the final examination of his disciples. He had put a dead bird far away on a tree as a target. He asked one of his disciples, Duryodhana, "What are you seeing?" Duryodhana said, "Everything! The trees, the sun rising behind them, the bird that you have put as a target. I am seeing everything." Dronacharya asked another disciple; he said, "I see only the bird." He is more concentrated. Duryodhana has his mind spread all over the place. The second disciple says he is seeing only the bird. But the master is not satisfied. He asks Arjuna, "What are you seeing?" Arjuna says, "Only the eye of the bird that you have told us is going to be the target. I don't see anything else." His concentration has come even more narrow. And for an archer, this kind of concentration is needed. But meditation is not archery. Contemplation is not being concentrated on a single object, but thinking about the same object from every possible aspect. For example, somebody is contemplating about love - what does it mean? He remains confined to a certain line of thinking, not to a certain object, but to a certain subject. And "meditation", in all the languages of the world except the Indian, Chinese and Japanese, also gives the feeling.... The archer is concentrated, but he is not concerned with the eye, the bull's - eye. His concern is how to shoot the arrow so that it reaches the eye; his concern is not to miss the target. Meditation, as far as Western languages are concerned, is going deeply into one object - thinking, in its deeper implications. Contemplation was linear; you were thinking about a subject from all possible aspects, but the mind was moving. In meditation the mind is not moving. It is similar to concentration without any arrows. Your thoughts are the arrows, but they are hitting the same subject deeper and deeper and deeper - not in a line, not horizontal but vertical. There is no word in Western languages which can translate the word dhyana absolutely and adequately. "Meditation" has been chosen because there is no other word, but it is a wrong choice. Out of the three words, it is the best, but dhyana, ch'an or zen have a totally different meaning: mind has stopped. In concentration mind has narrowed, in contemplation it is flowing in a line on a particular subject, in meditation it is concentrated, and instead of arrows it is throwing thoughts deeper and deeper into the same object. But all three processes belong to the mind. Dhyana means the mind has been put aside. There is no concentration, there is no contemplation, there is no meditation. It is a state of no-mind; it is absolute silence, not even a small stirring of any thought. In the East, so many devices have been tried... how to stop the mind chattering continuously, how to bypass it, how to stop it, how to go beyond it. Chuang Tzu has his own, unique contribution. He talks to his disciples in absurdities, and the mind cannot tackle them. The mind needs something reasonable, rational, logical; that is its territory. The absurd is beyond it. I have told you the famous story about Chuang Tzu: One morning he woke up with tears in his eyes, so sad and so depressed. His disciples had never seen him sad or depressed or with tears; he is an enlightened master... what has happened? They all rushed and enquired, "Can we be of some help?" Chuang Tzu said, "I don't think so." They said, "Still, we want to know what is the problem that is torturing you so much. You are beyond problems!" Chuang Tzu said, "I used to be, but last night I saw a dream and it has disturbed my whole attainment, achievement, self-realization, enlightenment - everything has gone down the drain." They said, "Just a dream?" He said, "It was not just a dream, it has shattered me into pieces." They said, "Still, please tell us the dream!" The dream was that Chuang Tzu saw that he had become a butterfly. All the disciples laughed. They said, "Unnecessarily being depressed and crying and tears and thinking that your enlightenment and self-realization have all gone down the drain.... It is an ordinary dream, nothing to be worried about it. In dreams people see themselves becoming many things, but a dream is a dream." Chuang Tzu said, "I understand that a dream is a dream. The problem is that I am worried, who am I? If Chuang Tzu in his sleep can dream that he has become a butterfly, a butterfly in her dream can see she has become Chuang Tzu. And now I am puzzled. Who am I? - a Chuang Tzu or a butterfly? "If Chuang Tzu is capable of dreaming himself to be a butterfly, you cannot cancel the possibility of a butterfly taking a nap on the rose bushes and dreaming that she has become Chuang Tzu. Who can prevent her? And the question is, have I awakened, or is the butterfly dreaming that she is Chuang Tzu? You tell me who I am! - the butterfly or Chuang Tzu." They were all at a loss... what to say? This man goes on finding such absurd things. Millions of people for millions of years have been dreaming, but nobody has raised this question. You have been dreaming, but have you ever raised this question? - that when you wake up perhaps it is the beginning of a new dream. What makes you so certain that you are not dreaming? - in the dream you were so certain that you are a butterfly, and now you are so certain that you are Chuang Tzu. There is no difference in certainty. In fact when you are awake the possibility of suspicion is there, you can doubt; but when you are dreaming, there is even no doubt at all, no suspicion, no question mark - you are simply a butterfly. Chuang Tzu in tears sitting on his bed, all the disciples with closed eyes, their minds completely stuck. What can the mind say about it? The question is absurd. He asked one of the disciples who was near the door, "What is the matter? It seems to be really serious! I have never seen such seriousness here. And why is our master crying? Has somebody died or something?" The disciple said, "He has created a new absurdity. Nobody has died and nothing has happened; he is torturing us and nothing else! Now we have to meditate upon it." And he told him the problem. Lieh Tzu said, "Don't be worried. You meditate; I am coming." He went out, brought a bucket full of ice-cold water and poured it on Chuang Tzu. And Chuang Tzu said laughingly, "If you had been here before you would have saved all these idiots! They are looking so serious, as if they are really thinking. And you would have saved my tears and my misery. Just wait; don't pour the water, it is too cold." Lieh Tzu said, "Has your problem been solved or not?" Chuang Tzu said, "It is solved - you are my successor!" It is not a question to be solved by the mind. The mind is absolutely impotent. Chuang Tzu has hundreds of stories and he must have had a very strange kind of genius - even to invent those stories is not easy - but his teaching was very simple. And those who remained with him; all became enlightened. That is a rare phenomenon. He defeated even his own master Lao Tzu - a few people became enlightened, but most of Lao Tzu's disciples remained in their old ignorance. He defeated Gautam Buddha - a few of his disciples became enlightened, but that was a very small proportion, because he had thousands of disciples and not more than a dozen became enlightened. he would not leave you unless you had become enlightened. He was so much after you that finally people decided that it was better to become enlightened. Every day new torture... the only way to save yourself is to become enlightened. But his method was very simple, and this poem, Anand Shanti, tells in a very aphoristic way his whole approach. Lies are easy, truth is difficult - that is the common conditioning of humanity. But Chuang Tzu is certainly a man of tremendous insight. He says, easy is right. Then why have people been making right difficult? All your saints have been making right very difficult. There is a psychology behind it: only the difficult is attractive to your ego. The more difficult is the task, the more the ego feels challenged. Climbing Everest was difficult; hundreds of people had died before Edmund Hillary reached the top alive. For the whole century groups upon groups of mountaineers had been coming, and when Edmund Hillary reached, there was nothing to be found! Just at the very peak there is not even space enough... only one person can stand there, on the highest point. He was asked, "What prompted you? Knowing perfectly well that hundreds of mountaineers have lost their life during one hundred years, and not even their bodies have been found... why did you try this dangerous project?" He said, "I had to try. It was hurting my ego. I am a mountaineer, I love climbing mountains, and it was humiliating that there is Everest and nobody has been able to reach there. It is not a question of finding anything, but I feel so immensely happy." What is this happiness? You have not found anything! The happiness is that your ego has become more crystallized. You are the first man in the whole history who has reached Everest; now nobody can take your place. Anybody who will reach there will be second, third... but you have made a mark on the history; you are the first. You have not found anything, but you have found a deep nourishment for your ego. Perhaps Edmund Hillary himself is not aware of it. All the religions are making the right difficult, because the difficult is attractive - attractive to the ego. But the ego is not the truth; The ego is not right. Do you see the dilemma? The ego is attracted only towards the difficult. If you want people to become saints you have to make your right, your truth, your discipline very difficult. The more difficult it is, the more egoists will be attracted, almost magnetically pulled. But the ego is not right. It is the worst thing that can happen to a man. And it cannot deliver to you the right, the truth; it can only make your ego stronger. Chuang Tzu is saying in a simple statement the most pregnant statement: Easy is right. Because for the easy, ego has no attraction. If you are going towards the easy, the ego starts dying. And when there is no ego left, you have arrived to your reality - the right, the truth. And truth and right have to be natural. Easy means natural; you can find them without any effort. Easy is right means natural is right, effortlessness is right, egolessness is right. Going against the stream is difficult, but going with the stream is not difficult. So either choose the easiest things in life, the most natural things in life, and you will be right; or if you want to begin the other way, remember the criterion that the right has to produce easiness in you, relaxedness in you. CONTINUE EASY AND YOU ARE RIGHT. Never forget for a moment that the difficult is the food for the ego, and the ego is the barrier that makes you blind to see, makes you deaf to hear, makes your heart hard to open, makes it impossible for you to love, to dance, to sing. CONTINUE EASY. Your whole life should be an easy phenomenon. Then you will not be creating the ego. You will be a natural being, just ordinary. And to Chuang Tzu, and to me also, the ordinary is the most extraordinary. The people who are trying to be extraordinary have missed the goal. Just be ordinary, just be nobody. But all your conditionings are so corrupting; they corrupt you. They say; to be easy is to be lazy, to be ordinary is humiliating. If you don't try for power, for prestige, for respectability, then your life is meaningless - that has been forced into your mind. Chuang Tzu in these simple statements is taking away all your conditionings. CONTINUE EASY AND YOU ARE RIGHT. Never for a moment get attracted towards the difficult. It will make you somebody - a prime minister, a president - but it will not make you divine. Easy is divine. I have heard about an American super-rich man. He had all the things the world can offer and he had been striving all his life to be on the top; now he had reached and was feeling stupid inside because there was nothing on the top. If Edmund Hillary was intelligent enough, he must have felt stupid standing on Everest... for what have you been trying? The man who walked on the moon must have looked very embarrassed, although there was nobody to see him. This man had come to the top as far as money is concerned, and as far as money can purchase, he had purchased everything. And now he was looking stupid. What is the point of it all? Inside he is hollow. He has no time to give to his inner growth, no time even to be acquainted with himself. He dropped all his riches and rushed towards the East to find the truth, because three-fourths of his life was almost gone - just the tail has remained, the elephant has passed. But if something could be possible there were a few days left. He rushed fast. He went from one master to another master, but nobody could satisfy him, because whatever they were saying was again another trip of the ego. And he was well acquainted with that trip. It does not matter whether you are accumulating money or whether you are accumulating virtue, whether you are becoming respectable here or you are becoming respectable hereafter - it does not matter, it is the same game. Whether you are becoming a world-famous celebrity or a world- worshiped saint, there is no difference; both are ego numbers. And they were all telling him difficult disciplines and difficult, arduous ways of finding the truth; they were all saying, "It may not be possible in this life, but start anyhow. In the next life maybe.... The journey is long, the goal is a faraway star." But now nobody could deceive him. He had found that just becoming somebody special is an exercise in stupidity. Finally he heard about a saint who lived in the Himalayas. And people said, "If you are not satisfied with him, you will never be satisfied with anybody. Then forget the whole thing." So tired and tattered, walking for miles, finally he found the old man. He was very happy seeing the old man, but was shocked. Before he could say anything, the old man said, "Are you an American?" He said, "Yes, I am." The old man said, "Very good. Have you got any American cigarettes with you?" He said, "My God, where have I come! I have come to seek truth, to find the right...." He pulled out cigarettes and the old man started smoking. The American said, "You have not even asked me for what I have come here, tired, hungry...."
He said, "That does not matter." The American said, "I have come to find the truth!" The old man said, "Truth? You do one thing, you go back. And next time when you come, bring a lot of American cigarettes, because here in this place it is very difficult to find cigarettes. And I am an easy-going man, I don't make any effort; people come on their own. But I like the best cigarettes. Here Indians come with beedies...."
"But," the man asked, "what about my search?" The old man said, "Your search? This is the discipline for you: go back, get as many cigarettes as you can get and come back and remain here with me." The old man said, "I am an ordinary old man - no discipline, no religion, no philosophy - I only like to smoke cigarettes. You come here, and slowly, slowly you will also become just as ordinary as I am. And I tell you, to be ordinary, with no pretensions, is the right." And as the man was going back, puzzled, the old man said, "Listen, at least leave your wristwatch here, because I don't have any wristwatch so I don't know the time, what time.... And anyway you are coming back, so you can bring another wristwatch." Chuang Tzu would have liked this old man. EASY IS RIGHT. BEGIN RIGHT AND YOU ARE EASY. That has to be the criterion. If you feel uneasiness, tension, then what you have started cannot be right. And the last part is something never to be forgotten. THE RIGHT WAY TO GO EASY IS TO FORGET THE RIGHT WAY - because even to remember it is an uneasiness. THE RIGHT WAY TO GO EASY IS TO FORGET THE RIGHT WAY AND FORGET THAT THE GOING IS EASY. What is the need of remembering these things? Relax to such a point... be as natural as the trees and the birds. You will not find in the birds that somebody is a saint and somebody is a sinner; you will not find in the trees that somebody is virtuous and somebody is full of vices. Everything is easy - so easy that you need not remember it. I agree with Chuang Tzu with absolute, unconditional, categorical attunement. I would have loved to meet Chuang Tzu. If I were given the opportunity to meet one of the mystics of the whole human history, Chuang Tzu would be my choice. I have named this place Chuang Tzu Auditorium. He was very much misunderstood. It is obvious... because he was destroying all the priests, all the popes, all the imams, all the shankaracharyas; he was destroying the so-called great commandments for being right, and destroying them so easily. He was one of the most natural men the world has seen. He has not given any discipline, he has not given any doctrine, he has not given any catechism. He has simply explained one thing: that if you can be natural and ordinary, just like the birds and the trees, you will blossom, you will have your wings open in the vast sky. You don't have to be saints. Saints are very tense - more tense than sinners. I have known both. and if there is a choice I will choose the sinners as a company rather than the saints. Saints are the worst company, because their eyes are full of judgment about everything: You should do this and you should not do that. And they start dominating you, condemning you, humiliating you, insulting you, because what they are doing is the right and what you are doing is not the right thing. They have poisoned your nature so badly that if real criminals have to be found they will be found in your saints, not in your sinners. Your sinners have not done much harm to anybody. I have been visiting jails, meeting the criminals, and I was surprised that they are the most innocent people. And perhaps because they are the most innocent they have been caught. The cunning ones are doing far greater crimes, but they are not caught. Every law has loopholes. The cunning ones find the loopholes first; the innocent ones get caught, because they don't have that cunningness. It is really strange that when America forced me into jail without any cause.... And since they had no cause, and no reason to keep me in jail, they tried, as long as they could manage, to keep me in jail before the trial began, because once the trial began they didn't have any evidence for anything. But pre-trial they kept me for twelve days. It was a good experience to know... I had known criminals, prisoners, but only as a visitor - and this was a totally different experience, to be one amongst them. And it is surprising that I was taken to five jails just to harass me - for twelve days they went on changing jails - but to me it was a good experience. All the inmates of the jails received me, welcomed me. Behind their bars they were waving their hands and shouting, "Osho, don't be worried, truth is always victorious." And they were showing me the sign of victory from every cell, whenever I would enter a jail or I would get out of a jail. They would send me small notes: "We love you. We don't know you, but we have seen you on the television. We have heard you and we know you are innocent." Looking into their eyes and looking into the eyes of the law enforcement authorities, one could see the difference... who are the real criminals? The jailers, the marshals, the judges, they were the real criminals. You could see it in their eyes, in their faces. To torture me they refused to supply vegetarian food because no vegetarian has ever been in their jails - "So we don't have any arrangement." And when the inmates heard it, they started bringing fruits, nuts, milk, which was given to them, and they would say, "Osho, you take it. We can eat non-vegetarian food and it hurts us that you are hungry, that you are starving and we cannot do anything." My cell was full of fruits. And I used to tell them, "I cannot eat so many fruits, I cannot drink so much milk." But they would say, "Don't take this opportunity from us. You are not going to be here for long. Tomorrow they will move you again." And they would bring cuttings of my photographs from newspapers to be signed in their name, because this will be their memory - "We have lived with you, even if it was only for one day or two days." It is a very strange world in which we are living. Here criminals are rulers, here criminals are politicians, here criminals become presidents, vice presidents, prime ministers, because except the criminal, who wants power? An authentic human being wants peace, wants love, wants to be left alone, wants freedom to be himself. The very idea of dominating others is criminal. Chuang Tzu is right that if you feel any tension, then remember, whatever you are doing is not right. And he is the only man who has given such a beautiful criterion, EASY IS RIGHT. BEGIN RIGHT AND YOU ARE EASY. CONTINUE EASY AND YOU ARE RIGHT. THE RIGHT WAY TO GO EASY IS TO FORGET THE RIGHT WAY AND FORGET THAT THE GOING IS EASY. And this is also my message to my sannyasins: be natural. You don't have to be Christians, you don't have to be Hindus, you don't have to be Mohammedans - these are all ways of creating difficulties - you have to be just natural like trees and birds and animals. Become part of this relaxed universe - so relaxed that you forget all about easiness and you forget all about rightness. To me, this is enlightenment. I am simply reproducing what Zooni wrote on her facebook. It is a great experiment with honesty, truth and sincerity. I hope it inspires one and all. Something I wrote to the newspapers in Nagaland a while ago, extremely important every moment never the less. Sharing it here with the hope that we can all, make a difference, really build bridges. I come from Mainland India, the only time I use this identity is when I am in the north east and I question why.I get some answers and I think it would have been much better if we could have left it to be just a geographical identity, if at all we needed to use it. This is my 4th visit to the North East of India and 2nd time to Nagaland and each time, I am overwhelmed by the love and care I receive. I am here for a wedding and never before have I seen friends and family helping so much; I had never seen people in cars calling out to people standing on the streets asking if they wanted a lift. And also, I had never met anyone who felt as strongly about their identity as people here do. Feeling that “I do not belong” is one of the worst feelings ever, be it in the family, at school, or the place we live in. During my last visit to Nagaland, I saw the pain, the hurt you still carry in your hearts. I felt responsible. Since that day more than a year ago, my heart is full of acknowledgement and apology for all the hurt you carry against India, a country you feel you do not belong to. My deepest wish is to help you come out of the hurt and bitterness. But here, I want to share one more thing. I am a 25 year old woman and I love traveling. Many times, I am looked at as an alien or an object in my own country. People from different states laugh at my way of speaking. I often get into an argument with the rickshaw wallas in Delhi because they never charge the same price and I feel so angry. But, what I don’t want “is to feel like a victim”. Yes, there are people who are indifferent, who taunt me because I am fat. Who make me want to run away but I know that I am not the only one who feels that way just as I am sure you too feel in the rest of India. I am beginning to understand what you must feel coming from your traditional backgrounds trying to develop your relation with a very ancient civilization like India. I also understand that you have a very deep rooted history. I still do not know much about it but I understand that it is underlined with blood, pain and loss. But should we let the past ruin the present and the future of our children? My uncle here says “Hurts not transformed are always transferred”. Are we unknowingly doing the same?